A wave-like roof covers this vast transport hub in Utrecht designed by Dutch firm Benthem Crouwel Architects for the largest railway station in the Netherlands. 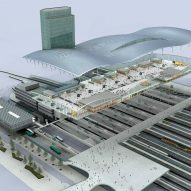 Made up of train, bus and tram platforms, the new Utrecht Central Station is three times the size of the city's original transport hub. 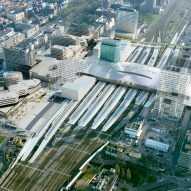 It is the third Dutch station completed by Benthem Crouwel Architects – which also rebuilt The Hague central station and was behind the upgrade of Rotterdam Centraal station. Two new city squares flank both entrances to the building: one on the side of the Jaarbeurs convention centre and the other on the city side. 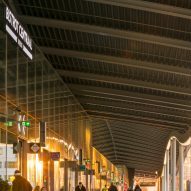 The architects chose the gently undulating roof shape to direct passengers between the entrance and exit. Inside, this movement is further emphasised by strips of LED lights arranged along the wavy structure of on the ceiling. 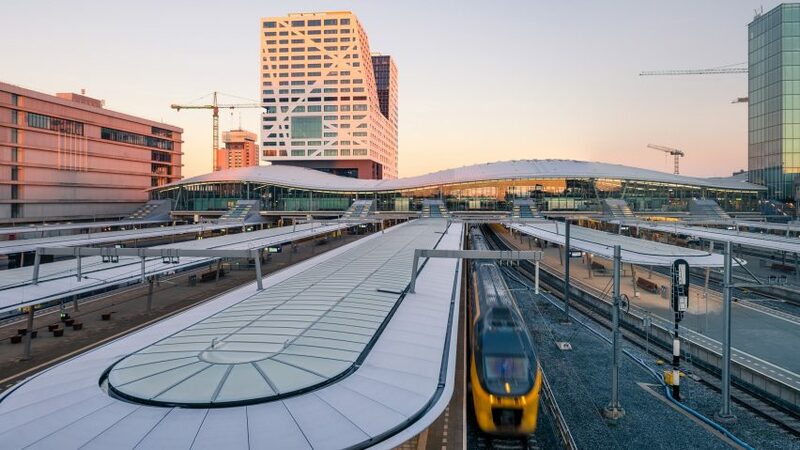 "We had the idea to design the original flat roof of Utrecht Central Station as a wave that radiates a dynamic movement and also functions as a natural way finder," said the architects. "Transversing to the tracks, in the longitudinal direction of the hall, the wave refers to the entrances and exits," they added. The steel wave is made up of three undulations that represent the distribution of functions in the station. 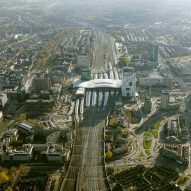 The highest provides a cover above the train station, while the lower two shelter the tram and bus station on either side. Glazed walls wrapping the station offers views to the eight train tracks that run underneath, perpendicular to the pedestrian movement through the building, as well as towards the city. "Through large glass walls, serving as curtains hanging from the roof of 235 by 85 metres, the stations offers all kinds of stunning lookouts, to trains, tracks and expansive views of the city," explained the architects. Thin skylights in the room bring natural daylight in the terminal, while also functioning as smoke hatches. An outdoor promenade runs along one side of the station creating a way for public to cross the railroad tracks without paying for tickets. Parking for 12,500 bicycles will be added underneath the square on the city site next year. 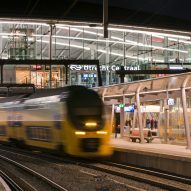 Utrecht Central Station is one of six new Dutch stations commissioned as part of the New Key Projects, a government initiative led by the Ministry of Housing, Spatial Planning and the Environment. 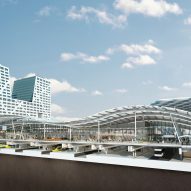 As well as Benthem Crouwels' Rotterdam Centraal and Den Haag Centraal, other stations in the scheme include Koen van Velsen Architects' Breda public transport terminal and the new Arnhem Station by UNStudio. Photography is by Jannes Linders from Your Captain Luchtfotografie.